Now a lot of you might right now have dropped your mug and screamed out “WHO! ?” or some of you may have gasped out “Oh, THAT guy!” Jack of Blades was the main antagonist of the original Fable game. If you’ve not played Fable 1, I implore you to do so as soon as you can as it’s a classic now. However just because the game is a classic that doesn’t give Jack of Blades an automatic entry onto our list. I freely admit that I haven’t played Mass Effect, it’s on the to-do list, but as a particularly cruel individual I do enjoy walking into rooms full of gaming nerds and deeply booming the words “Assuming direct and control” and watching them shudder. The Reapers are a deeply intimidating race, regarding us as little more than noisy ants, dominating minds and entire species, using them as weapons and resources. Though each of the titanic monsters has a different voice actor, their size creates a reverberating bass tone that sounds similar. It portrays them as impossibly ancient, possessed of unknowable intellect, and an intent that is above malevolence, only a process to be followed as a farmer to his field. It’s understandable that they have become a villain so memorable as to chill the blood of any Mass Effect fans. Naraku is a lot like Inuyasha himself in many ways. The most important of which is that Naraku is in fact a half-demon like the titular character. But this makes Naraku even more incensed than the typical yokai of the series. Most of them are fuelled by a greedy motive, but Naraku’s desire is far more brutal. He wishes to purge the half-human side of himself from his very being. … I don’t want to hear his voice, if it is going to deliver my untimely demise. We all know why Illidan Stormrage is one of the best bad guys in World of Warcraft. Actually, most of the voice acting in Warcraft in general is really well done. However, when you can deliver one line that had the Warcraft fans going for a long time, you know you’ve got an amazing voice. In the above video, Illidan gives an impassioned speech about how he was banished from his homeland. He went to another land to make it his new realm and now adventurers have made their way to his new realm. He sends out a deep, echoy warning that no villain can ever stand to. The power in the delivery of this line, along with the evil, desperate voice he has until this point, makes Illidan a strong candidate for one of the best villain voices. GLADoS has been in our Top 10’s repeatedly, there’s very little left to say on the subject. She’s a wonder, threatening, soothing, terrifying and reassuring with a wonderful singing voice to boot. Operatically trained Texan Ellen McLain brings her talent to the malevolent AI driven by the deeply embedded need to test the limits of the bodies of her test subjects until she runs out of science or test subjects, whichever comes first. Jonathan Coulton brings his writing and musical talent to those cheery and terrifying jingles from the credits of Portal, and of course Valve’s traditionally mute protagonists allows for some fantastic monologues, and the abandoned Aperture testing facility leaves GLADoS to fill the immensely popular games with personality. Hey, just because it’s a comedy doesn’t mean he’s not a villain. 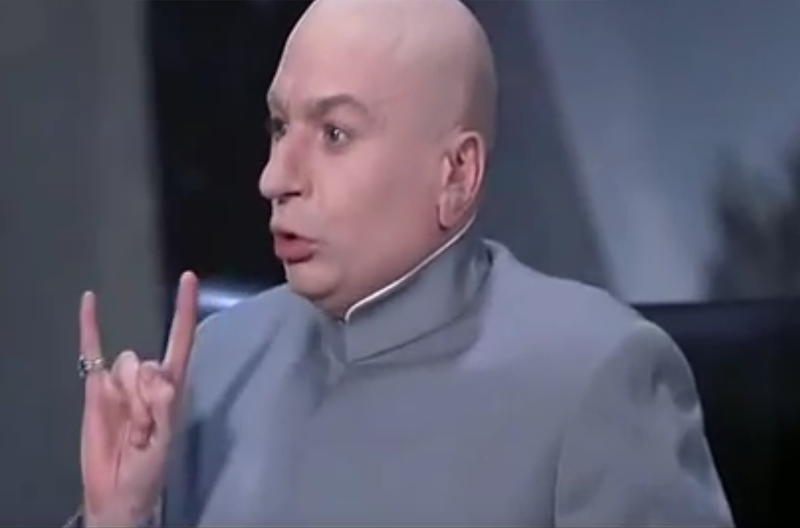 Doctor Evil is the arch-nemesis of Austin Powers and he has one of the most unique and memorable voices in film history. All you have to do is listen to how he insults Austin in the above video – It’s great! Couple this with some incredible comedic timing and you’ve got a villain that stands the test of time. Even if he is a complete goof ball. Doctor Evils most memorable lines include “One billion dollars!”, “Muwahahahaha” and “I shall call him… Mini-Me.” He’s not exactly the smartest villain in the world, but hey, he apparently owns Starbucks! It’s honestly amazing he’s not made his one billion dollars yet, but whilst Austin still has his mojo, Doctor Evil will not achieve his goals. At least he’s got a frickin’ “Death Laser” out there in space! Baddies, villains, evil people. Rarely are they so sweet that you’d like to think of them as a kindly lady who is there to help a school get in shape. Whether it’s health and safety of the students in the school, or the standards of education provided by the teachers of Hogwarts, this is a lady who should really be a saint, right? Well you’d be pretty wrong in this case, as Dolores is perhaps one of the most evil characters in all of Harry Potter. Sick, twisted but with a hint of sweet older lady, Dolores Umbridge is not a lady to be trifled with. All of the villains we’ve seen throughout this list so far are in some way contemptible, but Delores takes this to the next level. She’ll punish you by making you write lines only for it to be scarred deep into your flesh. She knows her curses and she’s not afraid to use them to teach students a valuable lesson. Plus all of those kitten pictures!? Urgh. True evil is afoot. Scar also has perhaps the greatest villain song. Be Prepared is powerful, ominous and in every way glorious when backed by the shrieking hyena choir. His ambition, his smarmy attitude, and that smirk practically ripped straight from Iron’s face, he was every bit the lion, and every bit the monster. Let’s get real for a second. This is the ultimate voice for authoritarianism. This is the man, man! We all know this voice and we don’t even need to hear his voice, but rather we just need to hear him breathe and we know it’s Darth Vader. When you’re so iconic that when you do the breathing that the majority of the public know of you, (even non-geeks), then you’re one hell of a villain. After all, no one wants to hear the words that comes out of this guys mouth, it’s not usually nice. First of all, Darth Vader has such a presence that even for our entry of Doctor Evil, we gave you the scene where he mimics Vader. Now we’re on the guy who started it all off. Deep voices, deep breathing and a deep back story to boot. Plus, he has come out with some of the best phrases of them all. Joel argued that his most memorable quote was his “Nooo!” I argued it is “I am your father” (hence the aforementioned Doctor Evil video)… Now it’s up to you to decide. Which of these three quotes is Vader’s most memorable? Was there really any other villain that could best Vader’s asthmatic intonations? That classic cackle, the sing-song showmanship, and that gravitas. Be it the dark growls of Heath Ledger’s greasepaint crimelord, the ever popular Mark Hamill, or the pleasant surprise of John DiMaggio, the Joker always has led the way in turning terrorism and murder into a performance piece. The crown prince of crime has always been Batman’s equal and opposite, both using theatrics to drive their point home, using image to back their purpose, but where Batman clings to shadow, myth and obscurity, Joker loves to take centre stage, seizing screen time whenever he can, filling the world with that legendary laughter that makes him the most memorable villainous voice of all. Do these four have a real voice? Well they do if you watch the series, but that’s not why their voice is so good. It’s actually from the classic video game, the original Pac-Man. See, when you actually listen they do have a real voice. They’re the best ghostly voices imaginable. The voice? Yes, since we’re on the way to Halloween, we wanted to get all spooky up in this place. The four ghosts make a constant ghostly noise as they roam around the halls of the Pac-Man maze. 2spooky4me! Cartman is the vilest little roll of flab that ever graced any screen, little or large. A foul-mouthed, criminal genius, monstrous brat that displays the worst of humanity, and yet it’s not just the bobble hat and double-wide backside that makes South-Park’s most despicable resident so distinctive. That voice is wheedling, needy, insidious and slightly wheezy from all the fat pressing on his lungs. People often mistake Cartman’s actions as the opinions of creators Matt Stone and Trey Parker, and don’t realise that he’s just a terrible and inhuman tub of lard. He has maybe performed some of the most evil acts of any other TV character, but you must absolutely respect his authoritah. That’s it for another Top 10, where we’ve delivered our personal top villain voices to you. But now we want you to add your voice to our list and let us know if you enjoyed our list this week or if you feel we missed the mark slightly. 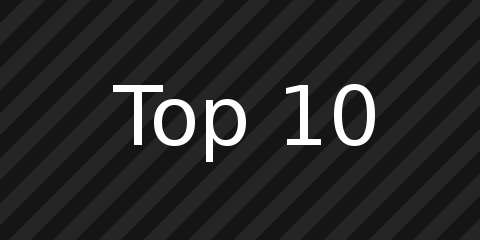 Also, lend us your hand by clicking on one of these Top 10 list choices for next week. I’ve had enough listening to all of this babble and I hope you are too. But if you want to keep the conversation going, please do not hesitate to throw a comment below, or over on Facebook and Twitter. Please remember to vote for next weeks’ Top 10, which takes place on Hallows Eve. Until then, stay spooky! This entry was posted on October 24, 2015 by GeekOut Team. It was filed under Anime talk, Entertainment, Gaming posts, Top 10 and was tagged with Anime, Austin Powers, Batman, darth vader, Doctor Evil, Dolores Umbridge, Eric Cartman, Fable, Fable 1, film, Ghosts, GLADoS, Halloween, Harbinger, Harry Potter, Illidan, Illidan Stormrage, Inky Blinky Pinky and Clyde, InuYasha, Jack of Blades, Joker, List, Mass Effect, Naraku, Pac-Man, Portal, Portal 2, Scar, South Park, Sovereign, Star Wars, The Lion King, Top 10, Top 10 Villain, Top 10 Villain Voices, video game, Villain, Villain Voices, Warcraft, World of Warcraft. Tim is not on the list? He is a wicked villain who refuses to give doctors large rooms. See, whilst he’s a wicked villain, he does things through Chaotic Good methods, which makes him more of an anti-hero of sorts!